Viet Hosting Review 2019: Is Viet Hosting a Good Hosting? Viet Hosting is a relatively new hosting company located in Ho Chi Min City, Vietnam. It offers various hosting plans along with cloud VPS, domains, and SSL certificates. According to its Facebook page, Viet Hosting was offering hosting services and domain names under a different company name as far back as 2007. In 2009, under the name Vietnam Server, it got a strong foothold in the hosting field. By 2016, the company had renamed to the current Viet Hosting, and today it offers a variety of hosting services, cloud VPS, and server solutions along with domains and SSL certificates. Viet Hosting’s website is in Vietnamese, but its client area supports twenty-five additional languages. Viet Hosting uses SSD storage for high performance, and it conducts daily and weekly backups (including remote) to ensure data security. The CloudLinux operating system isolates you from the effects of other hosted customers, and you can select the PHP version to suit your source code needs. The DirectAdmin control panel makes website administration easy. Besides shared hosting, Viet Hosting offers four reseller hosting, three email hosting, and four cloud VPS plans. Also, four colocation rental services, four private server rental plans, domain registration/transfer, SSL certificates, and server administration services. The 99.5% server uptime is lower than the industry average. Viet Hosting’s hosting plans are incredibly inexpensive, but you have to commit for at least three months to get good prices, and a full year to get the best prices. All plans are payable in U.S. dollars or Vietnamese dong via ATM card (and the OnePay payment gateway) or PayPal. Two additional payment options are presented in Vietnamese at the checkout, but I couldn’t translate them into English. Viet Hosting offers refunds on a sliding scale: 100% cash refund within 7 days of your activation date, a cash refund minus a one-month usage fee if requested between 7 and 15 days, and a credit to your account (to be used for other services) if requested after 15 days. 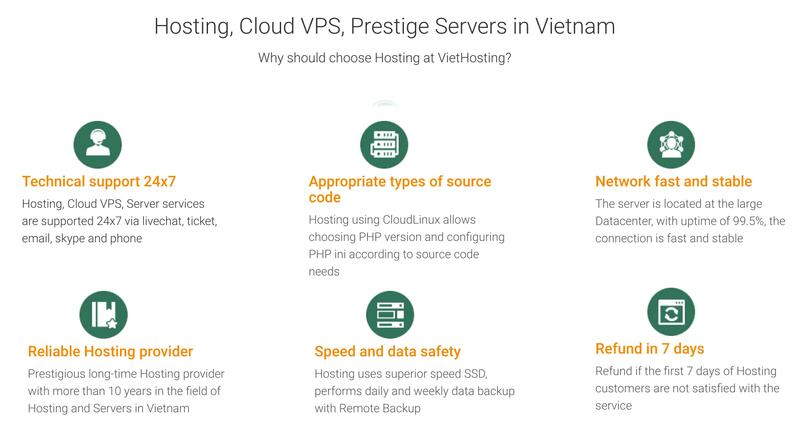 For self-support, Viet Hosting has a limited knowledge base that is biased towards VPS information. Viet Hosting provides a range of good value Linux shared hosting plans that come with a 100% refund if canceled within 7 days (and a sliding scale after that). It also offers cloud VPS plans, domain services, SSL certificates, and everything else you would expect this kind of host to offer. Get dirt cheap hosting backed by a 7-day cash refund from Viet Hosting. Wondering how Viet Hosting stacks up against other Web Hosting companies? Enter any other Web Hosting company and we will give you a side-by-side comparison.